Maybe you’re considering a storage unit as a way to hold onto your couch and tables in preparation for an upcoming move, or you want to put your birdbath or garden decor someplace warm for the winter. Maybe you’ve just got too much stuff. Whatever your reason is, we offer climate-controlled storage space to help you protect your possessions. If this is your first time using a storage unit here are some tips to help you prepare. Much like a basement, storage units are designed to stay dry but accidents happen and it’s better to be prepared for the worst case scenario. While most floors are sloped to keep water from pooling within the units, rare accidents are possible, such as something spilling in the next unit over. Get your hands on some wooden shipping pallets or blocks so your possessions will remain above the floor. A storage unit isn’t just another room in your house where you can move objects, so don’t treat it like one. You need to prepare by bringing packing materials like thick sheets of flexible plastic, cardboard boxes and bubble wrap to make sure everything is protected. Be careful with wrapping things in old newspapers as the ink can come off. The legs will come off most tables, so save space by breaking items down into easy-to-store segments. You can get the most out of your unit if you place items in safe, secure stacks, so bring some plywood or boards to place between layers of items to help make sure everything stays flat and firm. Leave an empty channel down the center of the storage unit so you can walk through the middle and access items without juggling too many objects. If items are in cardboard boxes, label them, especially if you plan to keep items in the storage unit for more than a few months. If you have something that could possibly leak fluids, like oil from a lawn mower, make sure you put them away or below items like clothing, furniture and sheets. Some homeowners’ insurance policies will cover items in a storage unit. Others won’t, so check your policy to see if you should purchase any insurance for your unit. You can also modify your homeowners’ insurance policy, or you can try to purchase one through the storage unit. When planning a move during the winter months, keep these tips in mind to help ensure a smooth and safe move for all. 1) Keep an eye on the weather. Winter can pay a surprise visit so be aware of any changing conditions that might impact your move. 2) Set aside winter supplies. If you have pets, it is a good idea to board them during the move. You don’t want them underfoot and with doors open, you don’t want pets to get out and go missing! Moving is often an emotional trauma for pets, so it is best to bring pets to your new home when the household is calm and filled with familiar scents. 4) Let there be light (and heat). 5) Have a back-up plan. Make sure the sidewalks, walkways and driveways are cleared of snow and use salt or ice-melt so that the movers have clear and safe access to your home to move your belongings to the truck. 10) Prepare your car for winter. and can answer your questions. Fewer and fewer people know the folks in their neighborhood today. If you want to be the exception and get to know the people who live near you, then Halloween is a great time to reach out and meet the neighbors. If you just moved into a new neighborhood and would like an excuse to knock on the doors of a few neighbors you have a good opportunity. Your neighbors are the best source of information on how many trick-or-treaters to expect and how much candy to stock up on, and how elaborate the decorations can get. Try sharing something about your own Halloween experiences with them and a good conversation might follow. Try going all-out on your yard decorations or even building a haunted house in your garage. This will help draw some positive attention from your neighbors and they may engage you in a conversation that leads to a friendship. Just don’t make your display audibly loud or include bright lights that may annoy your neighbors. If you find that some of your neighbors don’t want to associate with you because of your tasteful Halloween display, well, those are the grumps you’d want to avoid anyway. Consider holding a costume party on one of the nights near Halloween and inviting the people in your neighborhood. This will give you a good chance to meet people on your terms and a plausible reason to knock on doors to give out the invites. Just be careful that nothing valuable is on display in your home that can easily be stolen. If the weather is good it might be best to hold a gathering outdoors. If you have kids of the right ages then tag along with them as they go trick-or-treating. You’ll get to see the neighborhood and meet all the people who live in it. Today’s a different world and not enough people know who they live near, but with a little courage Halloween provides a lot of great opportunities to break the ice and meet the neighbors. That’s especially important when you’ve just moved into a new area, but it’s also helpful when you’ve lived in your current home for years and never found a chance to meet anyone nearby. Not just in terms of cash value, but of personal value to you. Irreplaceable items like photo albums, small heirlooms and your wedding video should be set aside and put in your personal vehicle for the move. Also things like cash, jewelry, legal documents and stocks and bonds are too valuable to place in the moving truck, which could be targeted by thieves. Don’t load a moving truck with combustible materials like gasoline, matches, ammunition, paint thinners and aerosol cans because of the potential fire hazard. Also, be careful to exclude pressured containers like propane tanks, fire extinguishers and oxygen tanks. Hazardous chemicals like bleach, ammonia or car batteries should also be left behind. Contact your public works department for advice on how to safely dispose of them before you leave. Some foods like canned green beans can certainly make the journey, but when you’re cleaning out your cupboard don’t try to chance it with items like frozen food in a cooler. You may get delayed or arrive too tired to unload and end up attracting insects or rodents. The same goes for produce, dairy products and anything in a breakable glass jar. Moving is a big process and unfortunately, some materials simply won’t survive a long journey. Fortunately, most of those items are inexpensive and easily replaced and the risk of harming the rest of your stuff they present makes the decision to leave them behind an easy one. Chances are somewhere in your home is a big cup full of pens. Pens with business names, ballpoint tips, felt tips, clickable and capped pens, black and blue ink, and a few pencils. It’s usually a plastic cup, but it sometimes a large glass or a mug. Once in a while it’s a shallow box at the front of a drawer bursting with pens. Whatever the variations are, you probably have one right now. Now imagine your life without that cup of pens. We all accumulate little things here and there over time. A lot of those things are useful, but only up to a point or for very specific circumstances. The life you imagined without that cup of pens should not be any different because you would still have other pens to use. However, when you move, every item adds weight and volume to your boxes, regardless of the item’s actual usefulness. That’s one of the many reasons generations of people have used moving time as a chance to get rid of excess stuff. The trick is convincing yourself that you can get rid of perfectly good items, many of which you paid for with real money. Let that thought go and ask yourself if the item is doing you any good today, or if it’s just taking up space. Here’s some more good questions to ask yourself: Do I have something else that does the same thing as this item? Do these clothes actually fit me anymore and how often do I actually wear them? When was the last time I used this thing? Is this a broken thing I said I’d fix but never did? If I lost this item would I even bother to replace it? Is this a nostalgic item I could take a digital photo of instead of keeping? Try leaving your home and imagining that you lost everything and had to start over. Write down what you would need – everything from a toothbrush to a bed frame. Be specific, and add anything you would like to have, like your photo albums. When you get home look very hard at the items that you did not include. If you forgot about them, perhaps they’re not so important after all. What you actually do with the excess stuff is up to you: Moving sales, Craigslist ads, donations to thrift stores and landfills are all popular choices (Usually in that order). The important thing is to get rid of it. In time, your place can look more like something from an interior design magazine with lots of free space and simple, clean rooms. You’ve just arrived at your new home, but your pets will be confused about the new surroundings. It might be best to find a nearby kennel of friend to hold onto your pets while you move in. If you’re moving in the summer the house will likely be the same temperature as the outdoor weather when you first move in, and the front door and any yard gates will be wide open for hours at a time. Wait until the moving vehicles are unloaded before bringing your pets inside. Until then, make sure they are in a comfortable place and have plenty of water. Don’t forget to update your address and any other information on pet ID tags and microchips your pets wear. It’s also a good idea to take good identifying photos of your pets on your phone so if they do get loose you have images of them handy. As stressful as moving can be, it’s also exciting and refreshing in many ways. A little preparation and strategic actions can make the difference between starting on a sour note and a happy one. Moving with pets on moving day can be a chaotic activity. The house is being taken apart piece by piece, the front door is propped open for a long stretch of time and people are coming in and out all day. Now imagine a few loose, agitated animals thrown into the mix. It’s not pretty. Pets need to be kept out of the way for their safety and your sanity. Placing them with a friend or a kennel for a few days is your best option, as they’ll be happy, fed and prevented from running out the door. If you’re planning to bring a few items in a vehicle with you make sure you put the pet carriers in first so they are level and air and light can get inside. Load the carriers empty because you don’t want to leave pets in a hot car. The move itself will be a dramatic change for the pet’s routine, so start making tiny changes each day as you lead up to moving day. Move the cat’s food dish to a new location. Switch up the route or time when you walk your dog. This will your pets get used to some level of change ahead of time. Moving day is stressful enough. These steps can reduce the stress your pets feel and put them in a better mood to accept their new surroundings. Moving with pets during the summer brings a lot of challenges. Moving with pets is challenging and so is moving in summer in general is challenging when there is a high demand for moving companies, scorching temperatures that can melt some items during the trip and new homes take a long time to get down to a comfortable temperature. If that wasn’t enough, being a pet owner brings its own challenges. Pets tend to be creatures of habit and thrive on routine. They may be scared of the sudden changes, but some advanced planning and effort can help minimize those problems. Once you decide to move, select a pet carrier. If you don’t have one large enough for your pet to lie down in with food and water you will need to purchase a new one. Give Fido or Mittens some quality time in the pet carrier at home before you move. Make sure the bottom is padded sufficiently for comfort so your pet will be able to sleep inside it a few weeks before your move. Place toys and pet treats inside as well. The idea is to give your pet positive associations with the carrier. Hopefully a few weeks of these experiences will make the long journey less stressful for you and your pet. 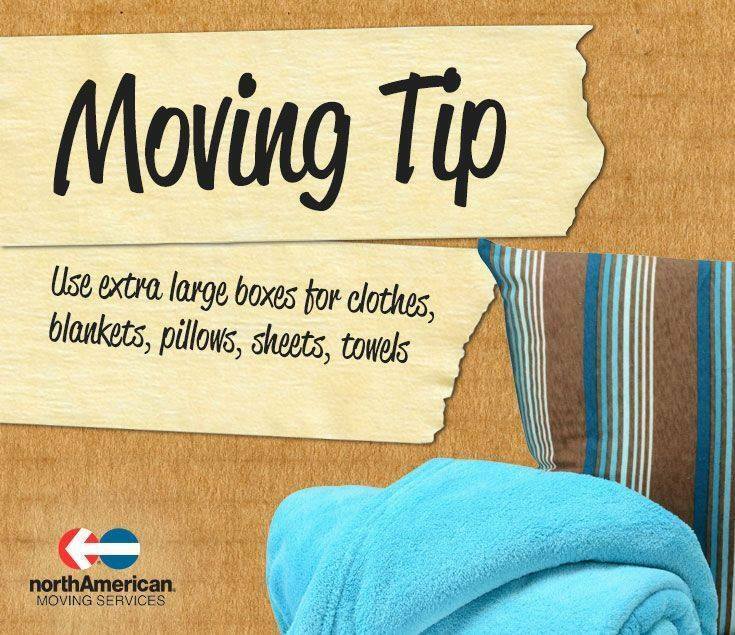 Pillows, linens, comforters and large fluffy items can be a challenge to pack. Many people just leave them loose during the move, but find they get damaged, stained or dirty. Save yourself the hassle and put them into oversized bins or boxes! That way, your pillow won’t end up in a puddle! It can be difficult for kids when they are moving and it’s hard to get them involved when there are so many moving parts and big items to move. 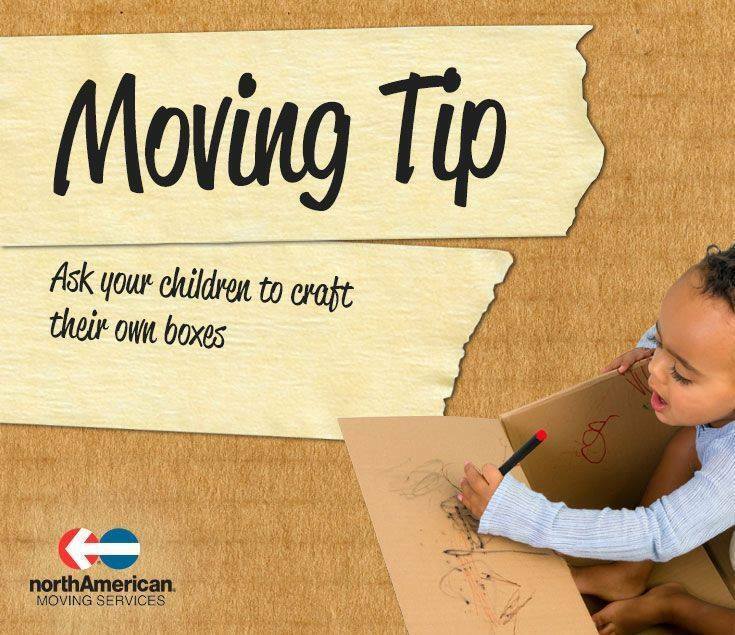 Consider getting them involved by having them decorate and label their own boxes for packing! This will make it fun and exciting for them and be helpful for you when you unpack.